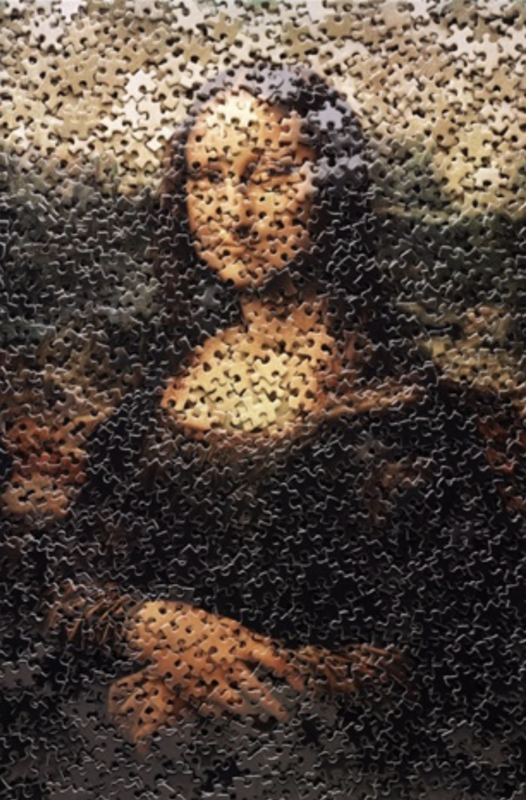 Photographer and mixed-media artist Vik Muniz is best known for repurposing everyday materials for intricate and heavily layered recreations of canonical artworks. Muniz works in a range of media, from trash to peanut butter and jelly. Muniz is best known for recreating famous imagery from art history and pop culture with unexpected, everyday objects, and photographing them. For example, Muniz’s Action Photo, After Hans Namuth (From Pictures of Chocolate), a Cibachrome print, is a Bosco Chocolate Syrup recreation of one of Hans Namuth‘s photographs of Jackson Pollock in his studio. The monumental series Pictures of Cars (after Ruscha) is his social commentary of the car culture of Los Angeles utilizing Ed Ruscha’s 60’s Pop masterpieces rendered from car ephemera. Muniz often works on a large scale and then he destroys the originals of his work and only the photo of his work remains. Muniz has spoken of wanting to make “color pictures that talked about color and also talked about the practical simplification of such impossible concepts”. He has spoken of an interest in making pictures that “reveal their process and material structure”, and describes himself as having been “a willing bystander in the middle of the shootout between structuralist and post-structuralist critique”. He cites the mosaics in a church in Ravenna as one of his influences. Muniz says that when he takes photographs, he intuitively searches for “a vantage point that would make the picture identical to the ones in my head before I’d made the works”, so that his photographs match those mental images. He sees photography as having “freed painting from its responsibility to depict the world as fact”.